Utopian studies is becoming more and more consciously interdisciplinary. 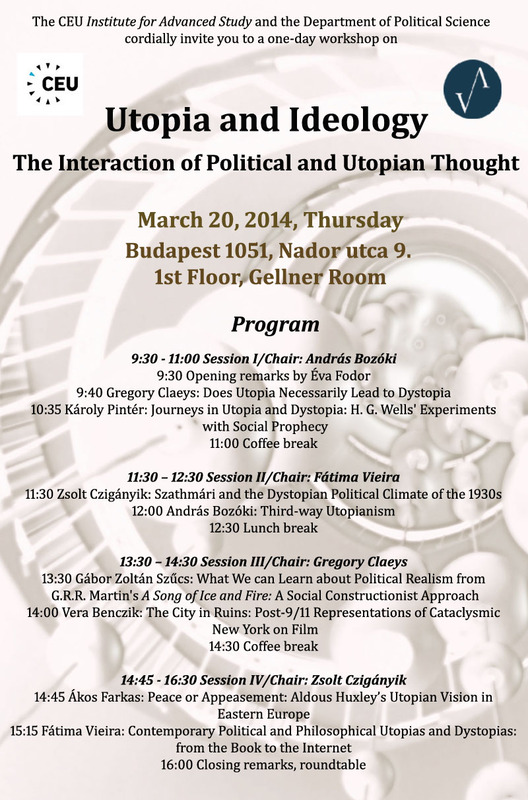 Our workshop will combine the efforts of literary studies and political science in analyzing utopias and dystopias, in investigating the interaction of political and utopian thought. Emphasis will be placed on 20th and 21st century phenomena, and major issues of general importance, such as the relationship of utopia and its negative counterpart will be addressed, alongside with problems concerning the individual and the collective. Not only classical writings, but popular fiction, movies and on-line phenomena will be analyzed. Besides literary aspects of utopias and dystopias, the utopian aspects of political discourse will be an object of scrutiny. The perspective that integrates literary hermeneutics with ideas and methods from political science should result in a more thorough understanding of utopian writing and its effect on political thought.